We seem to be entering that phase of the election cycle when fact-checking becomes an obsession on the part of the candidates, the media and the electorate. Back in ancient times (but within recent memory), fact-checking was the preserve of what we now call the “mainstream media,” i.e., major newspapers, magazines and – to a certain extent radio and television news programs. This made sense since those were the organizations that had access to sources of data and research experience needed to verify the accuracy of what the candidates and campaigns were saying, as well as platforms to communicate their discoveries nationwide. While all those bigger name verification sources continue to do their thing, the advent of blogging and social media (in conjunction with the exponential growth of free data sources on the Web as a whole) meant that it eventually became child’s play for anyone to enter the fact-checking business. While some of these new sites tried to mirror the claimed non-partisanship of sites like FactCheck, some found their niche by providing specifically partisan fact-checking services, offering to debunk the statements of just one candidate, or just one party. Such one-sided services were targeted less at a public eager to confirm what was true and false, than at fellow partisans hungry for confirmation that the candidate they never planned to vote for in the first place was a liar. Thus we arrive at today when, during the first debate, one of the candidates urged people to visit the new fact-checking service on the home page of her campaign web site, with some partisans demanding that the TV networks offer a crawl at the bottom of the screen that will debunk the fabrications a candidate (preferably the person they don’t like) is allegedly making in real time. This latest devolution of fact-checking to one more aspect of partisan warfare probably arises from the nature of the candidates in this year’s election, neither of whom is considered trustworthy by a majority of voters. But it also demonstrates our society’s fixation on the notion that everything (or at least the most important things) boil down to empirical truths (i.e., facts) that – with enough research – we can prove true or false. The only problem with this approach, beyond the appropriation of fact-checking by those with an agenda, has to do with the fact that facts do not exist in isolation. 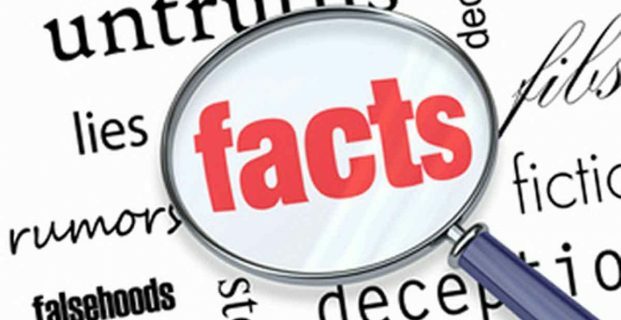 Rather, each fact is likely to be one of a large number of pieces of factual information that is being fit into an argument (usually referred to as a plan, proposal or agenda item). When discussing complex matters like budget politics, for example, a specific fact might be “true” if other statements are accepted in advance, but “false” if they are not. And given how many political proposals refer to things that will (or, at least, might) take place in the future, how are we to establish the truth or falsehood of statements that describe things which have not yet taken place? Such complexity should not lead to despair, and certainly not to post-modern rejection of truth as an attainable goal. But it should at least temper our expectation of how much fact-checking can ultimately do to help us achieve sufficient understanding. Just as importantly, facts generally serve as premises to an argument. But, as Critical Voter readers know, premises are simply the bricks out of which an argument is built, with logic providing the mortar that allows us to establish whether those premises lead to an argument’s valid conclusion. This means that, rather than continuing to expand the number of places where facts can be verified, someone needs to start offering logic-checking services that will confirm whether the arguments the candidates are presenting hold water, regardless of whether the premises are true or not. Now logic is a more difficult thing to analyze than factual truth or falsehood, and those consuming such analysis require a certain facility with logic and argumentation in order to follow along. But what a wonderful thing it would be if there was an audience large enough to support just one web site offering such a service.